We should talk about babies today. (Don’t tell Paul!) Of course, not our babies – but ALL of the babies ALL over the place. Have you noticed? It is for sure in the water – at church, at work, and all around the blog world, there are babies. And today is for celebrating one of those (soon-to-arrive) babies and his mama, my beautiful friend Aggie of Aggie’s Kitchen. Aggie is so kind-hearted and always encouraging and I’m so excited to get to celebrate her with some wonderful bloggers today. She is one of those people who you can instantly connect with and you feel like you have known her forever! 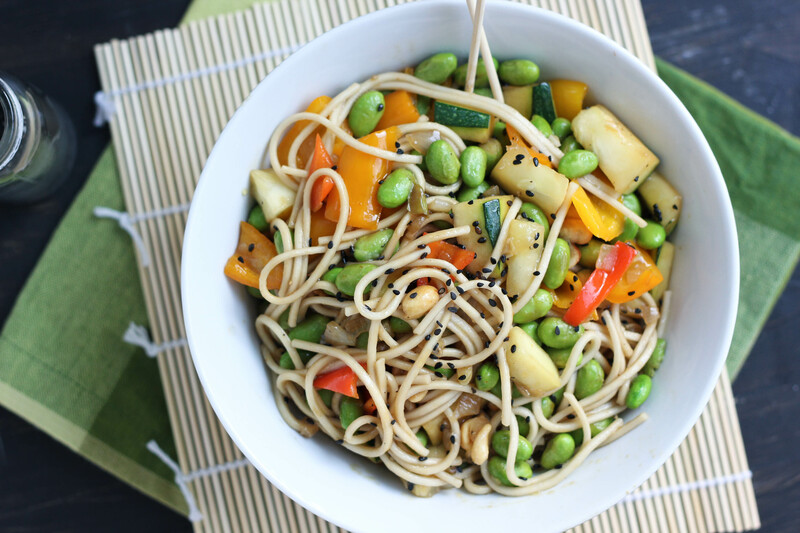 A quick and simple udon noodle stir-fry recipe with fresh zucchini, bell pepper, edamame and a spicy sesame sauce. Cook the noodles according to package directions, watching closely to not overcook. While the noodles cook, heat the olive oil in a wok or large non-stick skillet. Add the shallot and garlic and a small pinch of salt and stir well. When the shallot begins to soften, add the bell pepper and cook for about 2 minutes, until they begin to soften. Add the edamame and zucchini and stir well. Cook an additional 3-4 minutes until the zucchini is tender. Add the peanuts, season with salt and pepper and add the stir fry sauce and stir. Allow the sauce to thicken slightly. Drain the noodles and add to the cooked veggies. Garnish with additional sesame seeds and extra Sriracha if needed. You guys are the sweetest bloggers! This is so nice and so fun, bot to mention this pasta looks crazy delicious! I love all the fresh end of summer produce. YUM! Mmm…I could totally make this for dinner tonight. Exactly what I’m in the mood for. Love the black sesame seeds! Laughed when I read this because seriously, I feel like my world has exploded with babies! It IS in the air, lol. What a special shower, and this stir fry looks fab! Awww! Congratulations to Aggie!! I didn’t realize she was preggers – clearly I need to pay her site a visit! Love the surprise party and your stir fry looks marvelous! I’ll see you at the bottom of that bowl. Yuuum! This is my kind of meal! I can’t wait to see Aggie’s little bundle of joy – you know he/she is going to be adorable! This is SO perfect for Aggie. You nailed it! Love this!! The black sesame seeds look so inviting!!! what an awesome stir fry! delish! Yey for Aggie! Love this recipe and being involved in her virtual shower. Edamame Stir Fry? Yum! It’s so fun to be a part of this event with you! 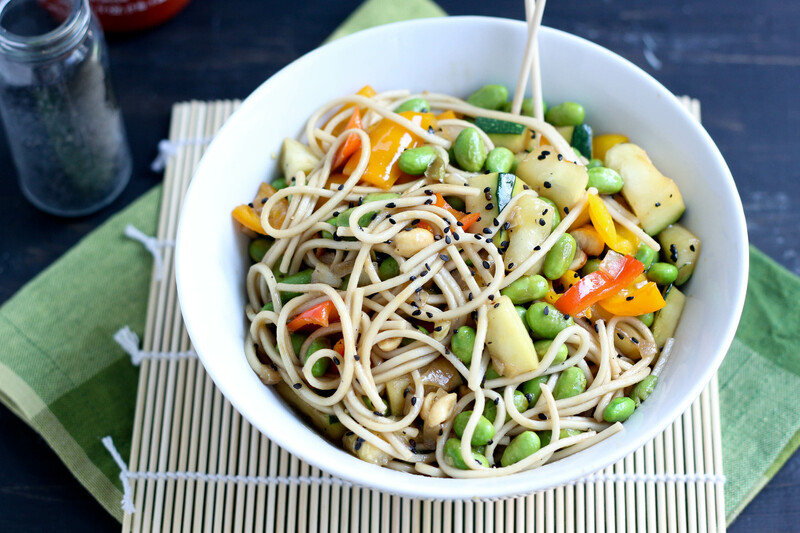 I love the idea of an edamame stir-fry! I think Aggie will adore this recipe! I love stir-fry, craving this for meatless Monday! This looks awesome and I can’t wait to check out all those links. Love Aggie too. Our new babies will be a few months apart! Yay for all the babies! Congrats to her and to anyone who gets to eat these noodles. So beautiful, Cassie! Looks amazing, I know Aggie would LOVE this! Thank you so much for joining in on the baby shower fun! Ooooooh….I want a big bowl of these noodles!! What a great dish to celebrate Aggie’s shower! So happy for Aggie, and this sounds sooo good! Lovely recipe! So many great recipes! I am bookmarking this one to make soon! Yay for Aggie!! What a beautiful bowl of food! I love vegetarian stir fried dishes. I love talking about babies! (Don’t tell the.boy). And yes, they are EVERYWHERE. I would love to have this at a future baby shower of mine…or just, you know. For dinner. Um can you bring this to me for dinner when my baby is born?! You know me well!! This looks amazing. I can’t thank you enough for the sweet surprise and words, love you friend!! I need a bowl of this right now. Seriously. It’s calling my name. Such a fun day this has been, celebrating Aggie and her little one! Aww, how exciting and what a sweet gesture for Aggie! This stir fry looks scrumptious and perfect for celebrating this wonderful woman, mama and blogger friend! Yay! These noodles look fabulous, Cassie! And yay for baby madness! 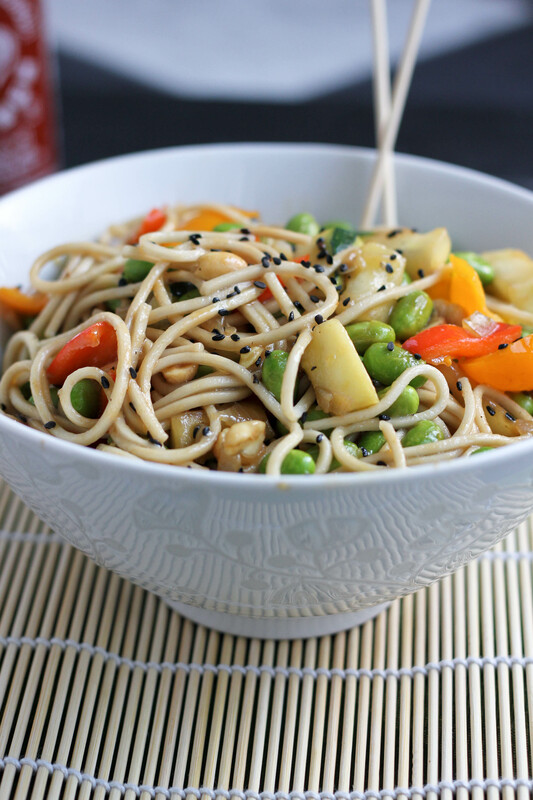 I love noodles and this looks perfect for dinner! Yay for more babies! They make our lives more beautiful! What a great, big, beautiful bowl of health this is! I adore udon noodles and savory/sweet sauces so girl, you’re speaking my language. Yay for babies! This stir fry is gorgeous! Congrats Aggie! I love this, Cassie! What a great way to celebrate Aggie. I wish I was at this baby shower in real life instead of virtually! Awwww you girls are so sweet to do this. 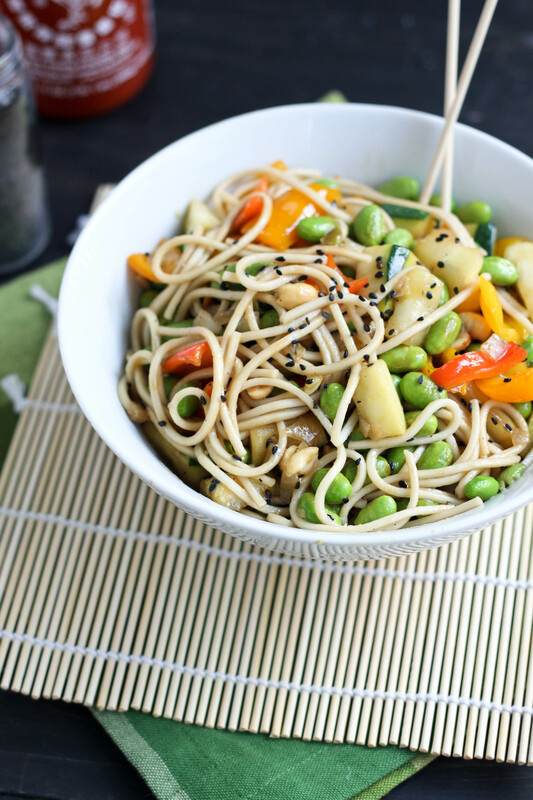 And this stir-fry looks so perfect for this hot summer weather we’ve been having! The colors in this are so stunning! I love how healthy it is too! Love this! A perfect shower food. Quick and easy and loaded with flavors! This looks like such a great weeknight meal! I am newly vegetarian for diet reasons and myy kids and I loved this. They begged me to add tofu and it was still awesome. I will add this to my recipe collection. Thank you for such a great recipe.